Print consultant, Mike Young, has an amusing story to tell. Actually, it forms the base of an analogy he uses to illustrate the necessity of incorporating superior processing techniques to drastically reduce production cost of screening, thereby shrinking overall print unit cost (PUC). Any business seeking profitable growth has to take full advantage of their screen processing abilities to succeed in becoming more competitive. As he sees it, the holy grail to be exceptionally competitive, without capital equipment acquisition, is none other than lowering production overheads by enhancing process techniques and efficiency - a factor that directly impacts any company's bottom line regardless of specialty. Before getting into this amusing story, let me first outline why reducing overall screening cost is so important. The world of printing in recent times has become fearfully more competitive for a variety of reasons. Offset has taken a major hit, for instance, as inkjet publishing and an abundant of electronic alternatives and handheld devices have made great inroads into their traditional territory. Consequently, offset clamors with open arms and now readily embraces smaller quantities than previously, largely to keep the presses turning over to stay in business. Similarly, screen has taken it on the chin, too, by losing out on smaller print volume business, being wholly unprofitable in most cases when compared to the inherent benefits and fast turnarounds of digital printing technology. Other than specialized applications and some non-four-color process work, digital has become the de facto choice to provide one-offs to low volumes, and in many instances, much more. Quantifying volumes by actual amount of prints is purposely avoided, as noted later. In a nutshell, this means offset has largely been forced to merge into the lower end of the volume market, albeit perhaps a less profitable one, by reinventing their printing operation to handle smaller quantities. Screen has taken a tumble because it cannot compete with digital at the lower end of the volume scale - whatever that number might be to any given company. Weighing on the volatility within the marketplace as everyone jostles to compete for their share of business, one should recognize that digital has stumbled, too, though for a completely different reason. In this instance, cause is more self-inflicted owing to its proliferating success - conceivably triggering its own hemorrhage as one printer opined. Digital equipment suppliers were once quoting incredible paybacks, with ROIs based on high-dollar sellable amounts per square foot/square meter. One supplier even hyped that printing just an hour a day will pay off a significant investment in just a few months. Like most things taken to the extreme, such may occur in rare instances and certainly not with credible companies making an honest living from mainstream printing. These sellable amounts have since nosedived significantly, in quoted form and in actuality for both roll and flatbed systems, thus pushing amortization further away from reality. Other than with certain niche markets, rapid turnarounds and outputting multiple locations, the scenario may well create difficulties in making PUC (print unit cost) more attractive to win profitable business. Regardless, the outcome of trying to lower PUC across the board forces digital providers to be shrewder and more creative with their business model to turn a profit. Higher output digital systems can help to lower PUC if competitively cost-effective - and so will screen print if allowed. Enhancing the front end of screen printing (screen making), to counter laid-back production, will considerably improve operation efficiency and profit margins with lower quantity work. Is It Qualifying or Quantifying Volumes? Much has been publicized recently about digital taking on noticeably larger volume of work from what the process typically supported from its inception. One recognizes inkjet technology and digital platforms have advanced considerably, particularly as it relates to increased output rates. After all, it cannot be stressed enough: speed is money in printing. While these advancements translates into handling more productivity during the same working day, providing there is enough jobs to take advantage of the higher output, actual PUC may not necessarily be lower due to heftier investments that typically comes with the latest and greatest systems. In fact, PUC could conceivably be higher if calculated void of bias. Be mindful that systems are often sought to handle increasing workloads and not necessarily to reduce PUC. In other words, advancement in digital output rates may well come at a price - regardless of other desirable equipment features might be thrown in the mix. Nonetheless, that is not the crux of the issue here, but rather the sensibility in quantifying lower volumes profitably with screen as opposed to higher PUC for similar volumes with digital. It has been touted for the longest time that the arrival of digital will bring about the demise of screen print, yet the reverse is fact. Screen clearly holds its own in the business of large volumes and special demands at any quantity. Its prowess is getting stronger than ever and in more diverse marketplaces, as well as creating numerous new ones. This is largely due to its innovative adaptability to go way beyond the ordinary realms of applying just a color or image. On the traditional commercial front, many screen production lines have been replaced en masse with digital systems, as if it were going out of fashion, since it makes good business strategic sense when catering to an increasing surge of smaller quantity volumes. This is an area where screen cannot hope to compete due to excessively high PUC, particularly with four-color process/multicolor work. Escalating the situation further, print buyers have largely gravitated towards smaller quantities, and a larger mix of varying sizes, despite such practice is at the expense of increased frequencies. Fierce competition in the world of screen has always been abound; the playing fields of business has become more overwhelming to shore up the bottom line. Digital has demonstrated itself to be a very convenient all-round provider at almost every turn. Nonetheless, when one hears digital print volumes are continuously increasing in leaps and bounds, no doubt at the expense of screen in most instances, one has to wonder why - the underpinning reason of this article. This is not a screen vs. digital or digital vs. screen debate on the pros and cons, but a practical review of where the "volume" problem can be considerably eased by simply increasing overall print "speed" - effectively the driving force that ultimately reduces PUC. Digital has made a profound entry in the printed imaging world by impressively delivering multicolor prints of almost any size, all without the significant upfront hefty prepress charges that screen entails. However, digital systems, substrate compatibility or ink technology issues are not under discussion here, nor are market specialties, physical image sizes, finish quality or contractual obligations, per se. The only missing criteria is print quantity or volume. Due to the high cost of screen making, it is not profitable (never was) or even desirable for short-volume work when digital perfectly fulfils this role and then some. There are exceptions, of course; however, they too are not under consideration here, only everyday quality commercial-type four-color graphics, labels/stickers, advertising, in-store media, banners and the like. Screen becomes much more cost-effective as production volume increases, since high upfront cost of pre-press (film and screen making) continually lessens when distributed over larger quantities. On the other hand, actual cost to produce digital prints remain constant, regardless of quantity for all intents and purposes (excluding discounts that might be offered for larger volume business), shown as Digital1 in the Print Quantity Matrix Chart. Quantifying short, medium or large quantity volumes with actual numbers is not practical as every company is different, including specialties, equipment, capabilities, skill levels, etc., that tend to separate one from another - partly the foundation of varying quoted prices. As for quantity, one printer's low-quantity volume might be considered medium or large to another company or even too low for quoting purposes with others. So far, so good. Since PUC remains constant with digital, unlike screen that becomes more cost-effective with larger volumes, there is another component of screen that does not always get factored into the equation. By and large, a digital printing system outputs according to the manufacturers' quoted rates for the type of job at hand, which intrinsically provides the fixed cost of PUC during the normal course of production-irrespective of quantity. However, the output or hourly production rate of screen printing is entirely a variable commodity, one that is based solely on how well printing excels in performance, or lack thereof, as determined by screen making abilities and of course elements of print workmanship. With the same job and similar automated screening equipment, proficient performing companies can easily out produce those that are poorly operated, at least to the factor of two, and in many instance much more, hence providing a huge differential in PUC. It is not unknown for many screening companies to effortlessly triple productivity by focusing on just a few aspects of the process. All this has a direct bearing as to where those lines are drawn on the quantity scale, possibly making screen more attractive and cost-effective at the lower end than previous, shown as the difference between Screen1 and Screen2 in the Print Quantity Matrix Chart. As a separate entity that is not under reviewed here, CTS technology (computer-to-screen) eliminates much of the upfront expense in screen making. The system avoids using costly film positives and saves considerable time that ultimately affords extremely competitive PUC at lower volumes than normal. As such, it would provide an even more favorable PUC curve than Screený in the Chart. 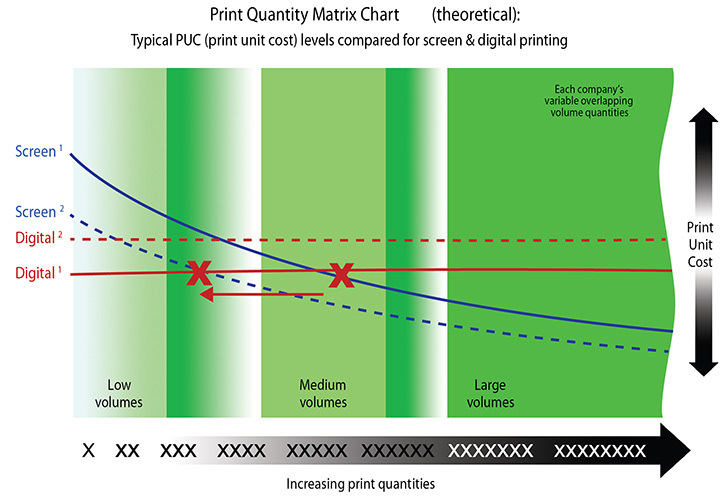 Still, determining precisely where the lower end of the cost-effective volume quantity lie is nevertheless largely ambiguous due to screen printing's enormously varying output, thereby causing stark contrasts between competing companies - one that is profitable handling lower-quantity work to others that can only compete with larger volumes. This scenario leads me to believe an inefficient screening operation is more likely to make greater use of digital with larger quantities than screening operations that are well-run, in all probability because it might be easier to bridge the differences with digital. It appears there is no universal defined breakeven point between the two processes quantity-wise, since it largely depends on numerous other factors, least of all with specialty, nature of job, in-house idiosyncrasies related to output capabilities of screening, etc. It is no secret providers have espoused digital print quantities reaching the 500 mark (profitably, presumably), while one company said it can make sense to print 1,000 digitally. Although details of the job were not shared, I am in no position to repudiate that statement except, if factually true, one could then reasonably assume their screening operation must be wholly ineffective as it relates to viable output or does not have screen capabilities. Appreciating what has been seen and heard, my contention is it is easier to capitalize on digital than trying to fix a poorly run, ineffective screening operation. However, while companies invest many thousands or even hundreds of thousands to upgrade digital capabilities for faster outputs, screen tends to be relegated, pushed aside, perhaps neglected and left to survive where and whenever it can. Ignoring subtle but ongoing improvements to an existing operation makes it even tougher for screen to compete profitably for normal business at the lower-quantity scale. The irony of what has happened in a number of quarters is large capital investments have been sought to improve digital output rates, yet, what if any low-cost/no-cost processing improvements have been made to improve screen output that would greatly influence the lowering of PUC? The point is businesses with both screen and digital capabilities may be pleasantly surprised to learn they can get a lot more mileage and perhaps untapped benefits from screen, merely by increasing productivity to become much more competitive towards the smaller-volume range. Doing so is a win-win strategy for all and without the necessity of new hefty capital investments. The objective of this article is not to switch any company's alliance to digital back to screen. It is about making screen more proficient and profitable with lower quantities to increase business. While there are a several ways this can be achieved, the two most significant is either embracing CTS - computerization of the image rather than costly film positives, as alluded to easier - or increase productivity by enhancing production output typically at no additional cost. While incorporating either one alters the playing field, our focus will be the latter as the former requires capital equipment investment. One of the biggest pitfalls that prevents screen printing operations reaching high productivity rates is to be found not on the production floor, as most people believe, but in screen making, from routinely making do with grossly under tensioned screens. This part of the process is a major drawback with any screening operation and one that constantly separates them from top performers. In many instances, screen tension is not even close to where it ought to be, either for the fabric grade or to aid critical elements of the job. Promising from the outset that this would not be a technical article, it is nonetheless an inspirational message about an amusing event, which appropriately says much about why suitable screen tension should be used to excel productivity and more. Astute printers have known for the longest time the direct relationship between proper tension levels, as defined by fabric manufactures, to the sheer quality and hassle-free production it naturally returns right out of the gate, simply by adopting them as standard regardless of job. Before we go any further about qualifying suitable tension levels, let's change direction a by asking a question about two seemingly unrelated things, from an analogy standpoint. What does a car tire share in common with screen tension? Moreover, how important is having the correct air pressure in a tire? The question relates to an event that happened a long time ago about someone's unfortunate experience from my neighborhood, who inadvertently created a mini-disaster of his own making while mowing his lawn. He admitted his embarrassment about the incident taking place, particularly as a truck driver himself and should have known better about tire pressure. When asking attendees during my training sessions what is the difference between the two, they invariably look around the room at one another, drawing a long puzzling blank stare, then suddenly realize it must be something crucial. On occasions the right response is given, "correct pressure and tension are both very important," or subtle variations. In other words, what pressure does for tires is identical in every respect to what tension does for screens. Read that again if not digested. The reality is we drive on tires daily without ever giving pressure a second thought. Well, that is exactly what this poor feller did. He did care about pressure, but for a compelling reason he did not bother with it this time - an inaction he painfully lived to regret. I conveniently use this incidence frequently because it says so much about tire pressure being effectively one and the same to screen tension - except for one major difference. The overall performance of a car suffers considerably; safety among other things are immediately compromised when driving on underinflated tires. In a huge class-action lawsuit regarding loss of tire pressure, it was claimed that a mere drop of 4 psi (0.275 bar) tire pressure resulted in a safety reduction by the factor of 12 percent! Safety would then begin to deteriorate rapidly thereafter, to a point of losing complete control of the vehicle. This is comparable with the declining performance of what under-tensioned screens typically yield; the only difference between that of a tire is the screen drives print quality, and ultimately productivity as a result rather than a vehicle. Printing with lower tension than desired for the fabric grade, or crucial demands for which the job may require, immediately throws productivity and more into jeopardy. It has been verified time and again that screen tension in production is often less than half than what fabric manufacturers' state in their data sheets for ideal tension for quality work. Despite the noted comparisons is used as an analogy, it is not a stretch to say under-tensioned screens are akin to driving around with tires considerably underinflated. This is why proper screen tension is so important when trying to acquire the utmost from the process. Interestingly, when anyone sees their car tires with an obvious loss of pressure, the first thing the owner does is to drive to the nearest garage and inflate them. And there is a very good reason for this sudden sense of urgency. Subconsciously, they know only too well safety will be compromised and, as a result, drive slower than normal and even more cautiously in adverse conditions until tires have been properly inflated. But what about the poor screen that could also be equally "underinflated" as the car tire? What is that weak tension going to do with any print job if the ensuing harmful influences of underinflated tires directly affect ones' ability to drive or print normally? The situation can potentially lead to numerous printing issues, least of all negatively affecting productivity and a whole lot more. This way of operating is not conducive nor profitable. If screening departments routinely operate in this fashion, it means money is wantonly thrown down the drain and opportunities lost, particularly with lower-volume business. For a screen to begin to perform exceptionally well is no different from the expectation of a properly inflated tire to do the same on the road. Put into extreme terms, four nearly flat tires will make the car inoperable - period. This is not how a quality-focused screen printing operation should function and operate. Suitable screen tension is the factor that begets initial overall quality and productivity in the first instance. Everything else that follows tension could be considered as secondary at this point, because none of their interrelating elements can function properly if tension is not there to begin with. Coming back to our analogy, one may now be wondering about the relationship between tire pressure and cutting grass with a riding lawn mower. Let me explain. While the truck driver was obviously aware of the value of using correct tire pressure, he failed to practice what he knew was fundamental in his job. That became clearly apparent one early evening when mowing his large front lawn at home. As he was going on vacation the following morning, he wanted to mow the lawn while there was still some daylight left. His mower was recently out of action so his next-door neighbor kindly obliged by lending him his riding mower. The neighbor's mower worked and functioned similarly to his own except for one small detail (his words, not mine) - all four tires were soft and close to being flat. Without a compressor between them, the clock ticking away, and not wanting to hurt his neighbor's feelings, he went ahead and used the mower just to get the job done before it got too dark. That was his big mistake! As you can well imagine, the mower was very tough to control and took a lot longer to complete despite newly sharpened cutting blades. When finished, his lawn looked an absolute mess. The mower's small front wheels made large gashes as they dug into the ground when making sharp turns at the end of each pass. The large rear wheels also did a great job of digging into the surface, creating trench-like tracks over the whole landscape - similar to a field that has just been ploughed by a farmer. The truck driver was obviously concerned at first, but totally unware of the full extent of the real damage until later. He then noticed grass was growing healthy but only in narrow strips, in trench-like rows, the kind of rows that only underinflated tires can possibly cause! An otherwise perfectly looking lawn was entirely ruined because the mower's tires were not properly inflated for the job. Fast-forward three years later, proof of underinflated tires was still visually evident for all to see, and probably will be for some time to come. I drove by the house one day and it can only be described as being an ugly-looking lawn, particularly when compared to those neat ones either side of his. I heard later he had the whole lawn dug up and rolled out to get it back to its original condition, but at a huge cost. It took three years to correct the damage, a luxury no screen printer can afford, especially with low-volume jobs. Assistant Professor, Sam Hoff, RIT New York, best summed it up by saying, "If there were no time to print the job properly the first time - where do you find the time to reprint it!" In retrospect, it is amazing how we take things for granted. In the riding mower scenario, underinflated tires played havoc to the beauty of one's homely landscape. While correct tire pressure plays a role to provide the proper foundation to do a job, suitable tension is in reality the foundation that supports welfare of the image. Therefore, tension has an enormous influence on visual appearance including productivity. High-quality productivity in the world of screen print is a factor of how well screens are made to begin with, in order to take advantage of press speed rather than relying mechanical on press speed alone. Production speed, or physical hourly output rate, by extension is entirely dependent on what the screen printing press receives. The more "perfect" the screen is (whatever level that may mean for any company including suitable tension), inevitably reduces obstacles that inhibits advancement, and thus opens the road to high productivity. When productivity is unhindered, it translates into a more profitable business model, especially with lower quantities, due to improving competitiveness of print unit cost. A further outcome is that it does not require large capital investments to achieve the objective, just the inclination to improve tension during screen making. To make the most of the screen, one must not neglect to reign in the many hidden benefits the process has to offers, or fail to encourage continuous improvements to succeed beyond all expectations. Surprisingly by default, excelling in performance through production efficiency will take care of itself, together with remarkably lower print quantities that impacts the bottom line. This article appeared in the SGIA Journal, November / December 2016 Issue and is reprinted with permission. Copyright 2017 Specialty Graphic Imaging Association (www.sgia.org). All Rights Reserved.